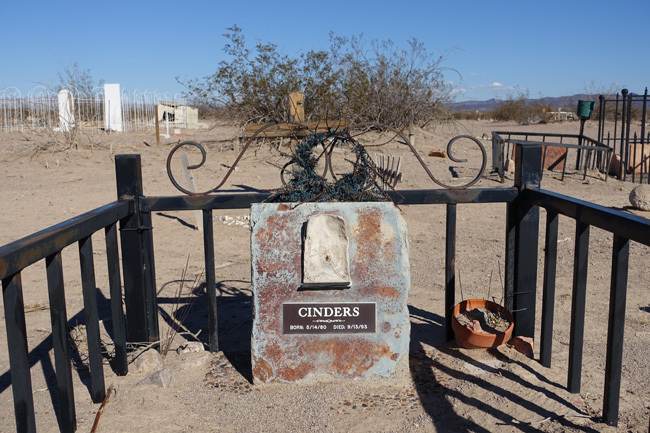 Along a desert highway in Southern Nevada lies Boulder City Pet Cemetery, an illegal graveyard with a murky past. The final resting place of hundreds of beloved pets, the sprawling stretch of land is rumored to hold the remains of a few unfortunate humans as well. 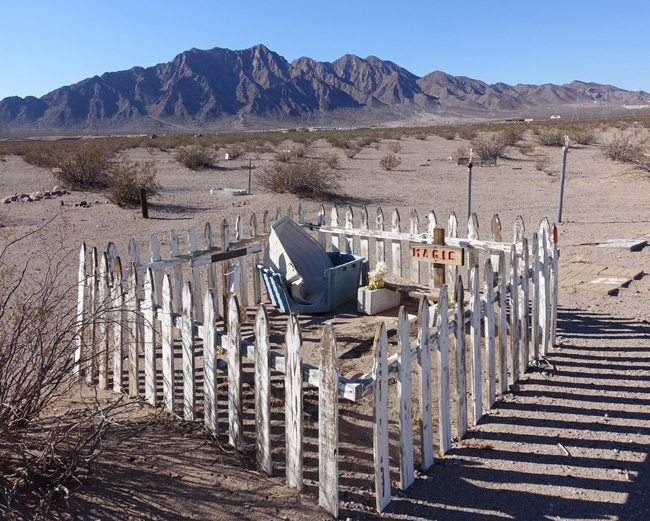 After an unplanned stop to appreciate the ruins of Searchlight, Nevada, I continued northward through the desert toward Boulder City. A few miles outside of town, I pulled off the highway. A barbed wire fence ran parallel to the road, stretching as far as the eye could see, interrupted only by a simple white gate. 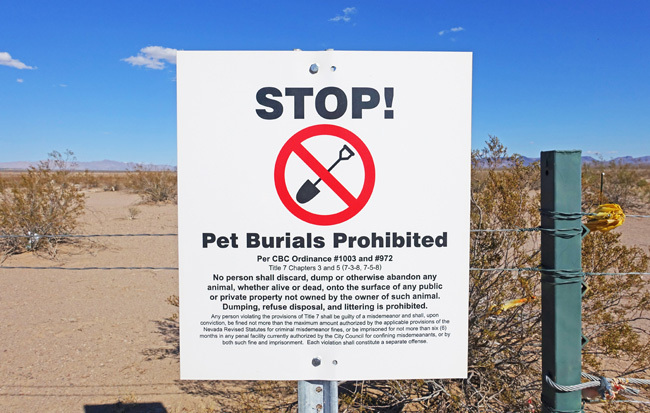 Several signs warned visitors that pet burial is prohibited. Sign outside Boulder City Pet Cemetery, warning visitors that pet burial is prohibited. On foot, I slipped easily through the gate and followed a well-worn path that led to the burial plots. I was immediately awed by the complexity of the grave sites. 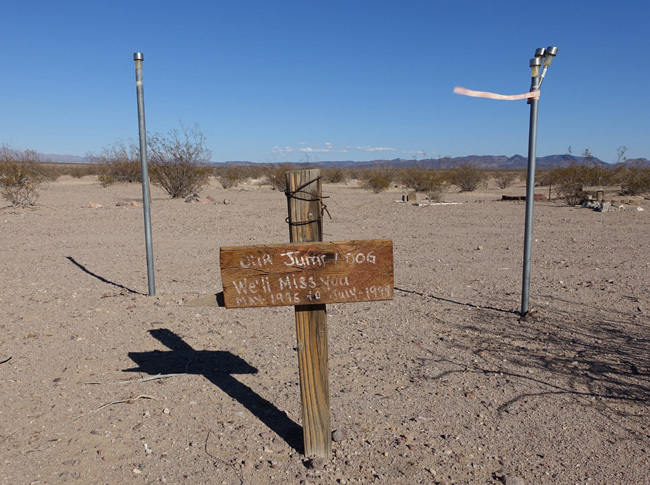 The grieving owners had clearly spent a great deal of time and effort in building memorials to honor their beloved pets. 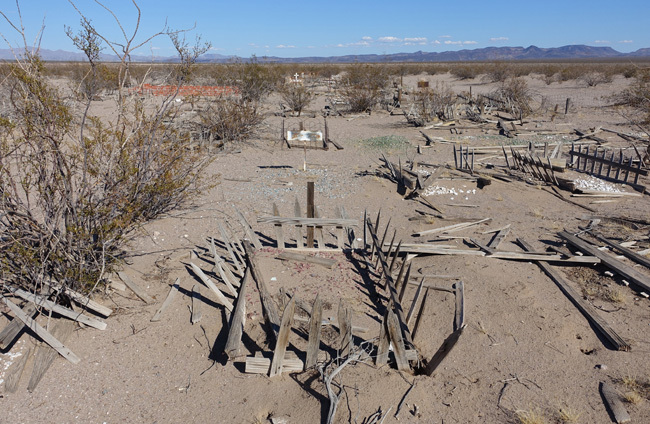 The oldest graves were situated in a large grid not far from the highway. They mostly consisted of wooden fences, a reminder of the picket fences that might have surrounded the yards that the dogs once called home. The fences are in rough shape, which is no surprise, considering that many of them are more than half a century old. Many of the grave markers were missing or so badly weathered that they were no longer legible. As I walked further into the cemetery, the grave sites became more spread out and were not arranged in the tidy grids of the earlier sites. 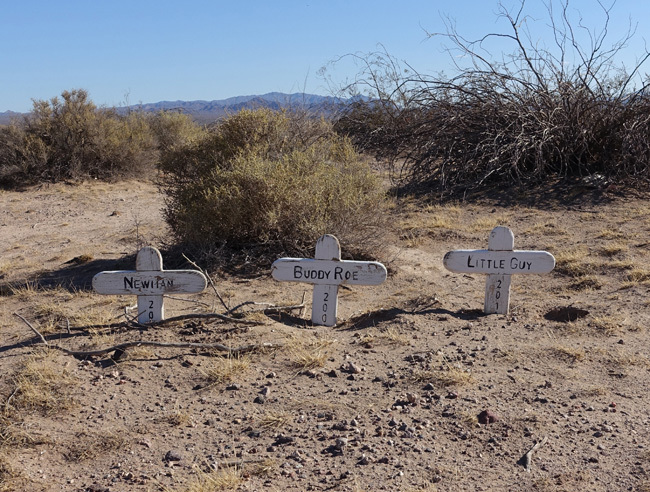 It is obvious that the animals buried in Boulder City Pet Cemetery knew a tremendous amount of love, and many of them lived long lives. A bench had been placed near a row of graves. I imagined an elderly couple holding one another and gazing out at the mountains as they recalled fond memories of their deceased companions. Some graves were marked by professionally engraved headstones. Some even bore images of the deceased. Others were lovingly crafted by hand. There were even family plots. 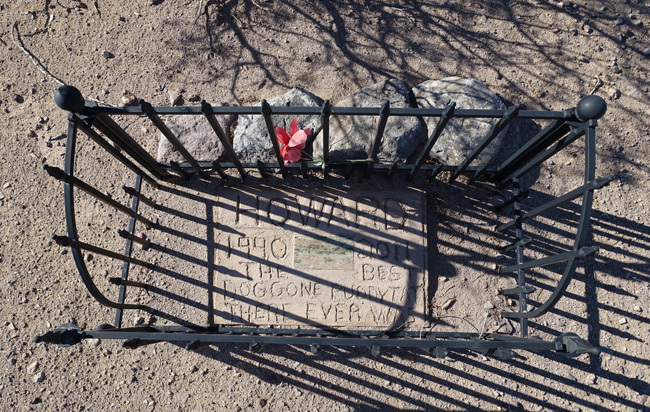 The history of Boulder City Pet Cemetery is surprisingly difficult to pin down. 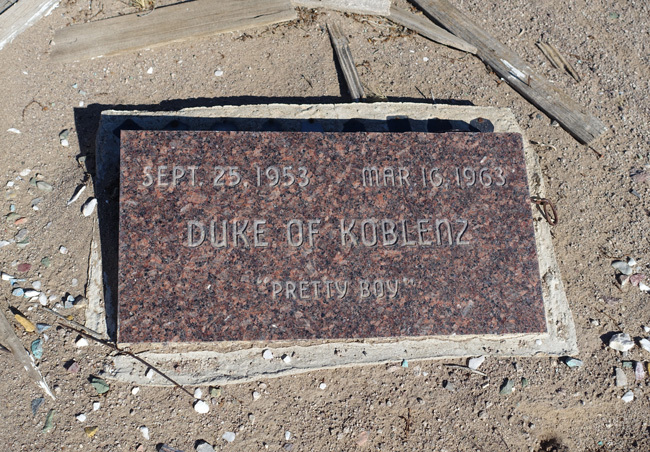 According to some, the first pets were buried there in 1931. 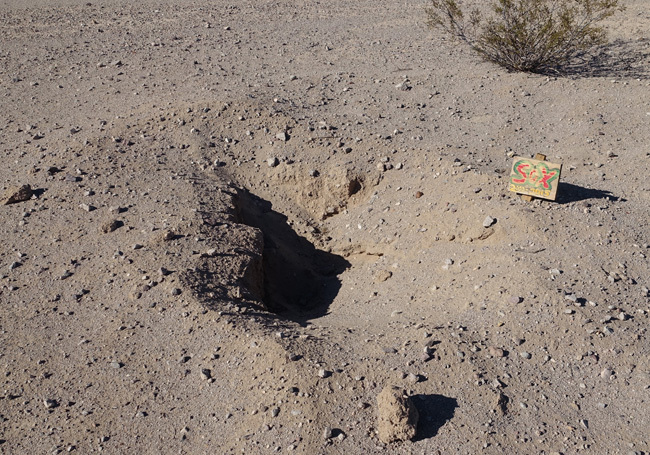 I could find no graves dating back that far, but it is possible that the markers have been destroyed or rendered illegible. 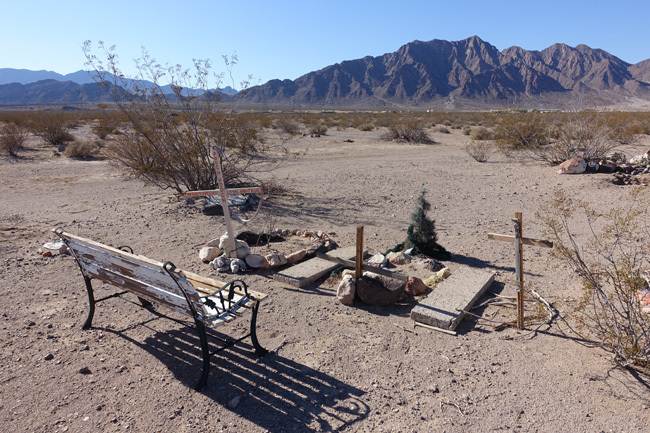 Others claim the cemetery was established in 1953 by Marwood Doud, a Boulder City veterinarian. A third rumor states that a civil engineer named Emory Lockette created the cemetery in 1953 and provided pet funeral services for $50. Even the name is somewhat of a mystery. 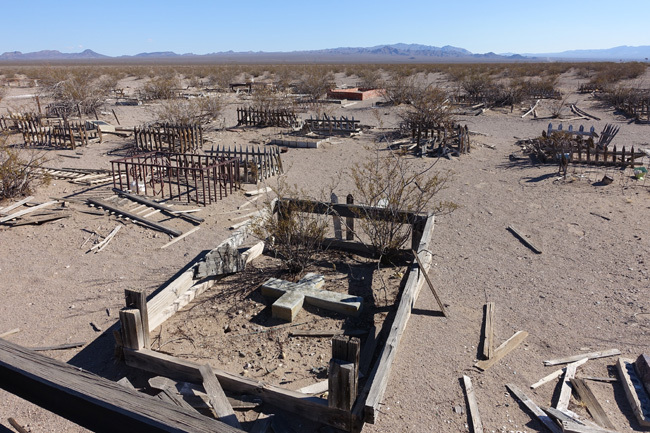 At the time of its inception, the cemetery occupied federal land, where burial of pets was illegal, which might explain why it was never given an official name. 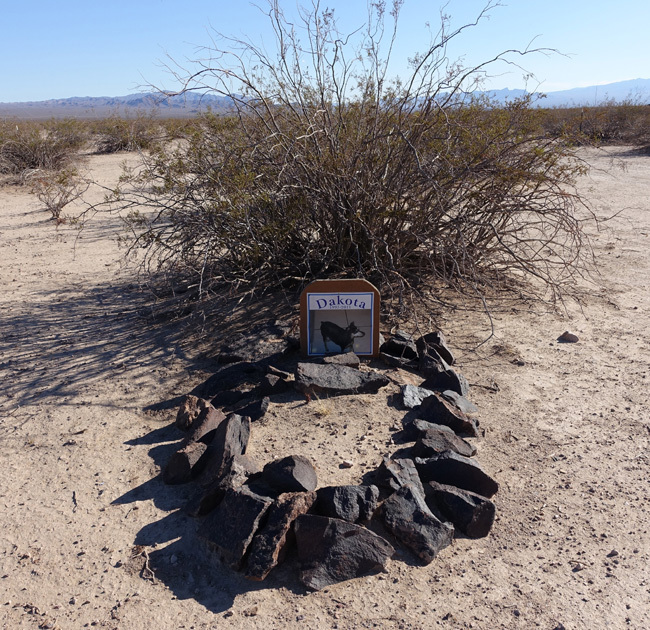 It is most often referred to as Boulder City Pet Cemetery, but has also been called El Dorado Valley Pet Cemetery. In 1976, the State of Nevada requested that the Bureau of Land Management clear the land. 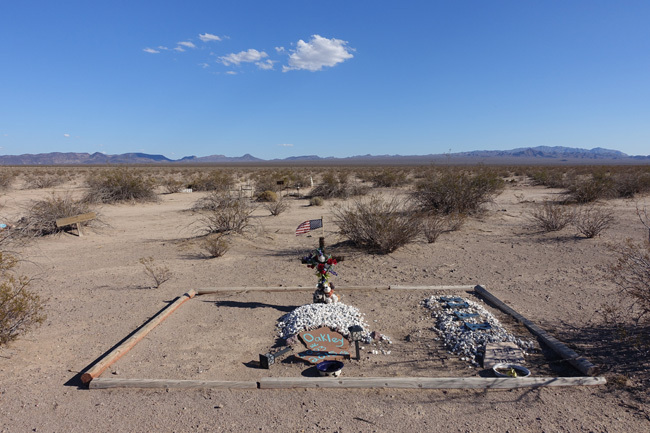 In response, a group of local citizens formed the Incorporated Desert Pet Cemetery Association and successfully fought against the removal of the pets' graves. Further efforts to have the land officially recognized as a legal pet burial ground were unsuccessful. 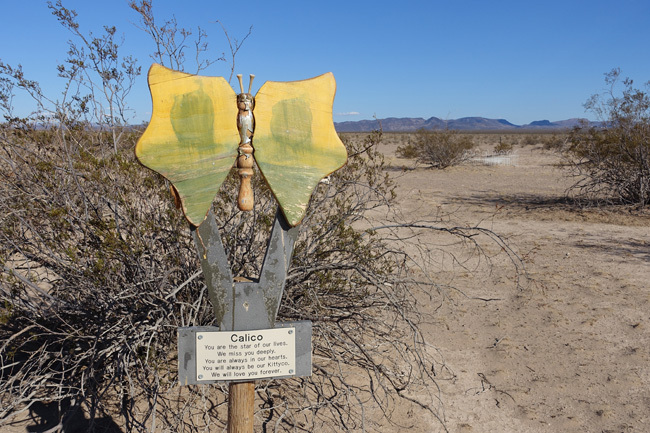 Boulder City purchased the Eldorado Valley in 1995, and set aside 85,000 acres as Desert Tortoise Habitat, which meant pet burial would remain illegal. Pet burials still occur though. 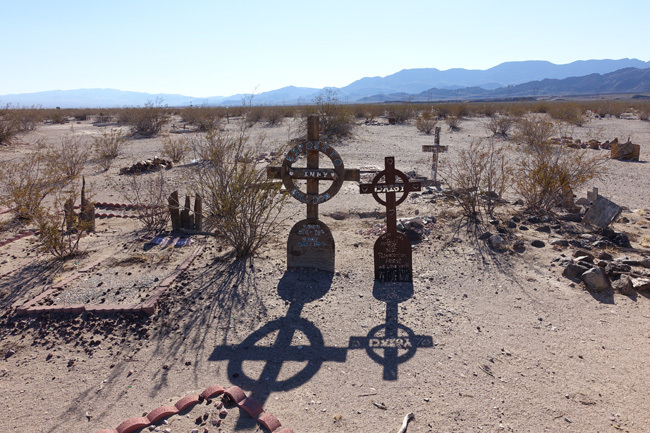 During my visit, I saw several grave markers with 2015 dates. 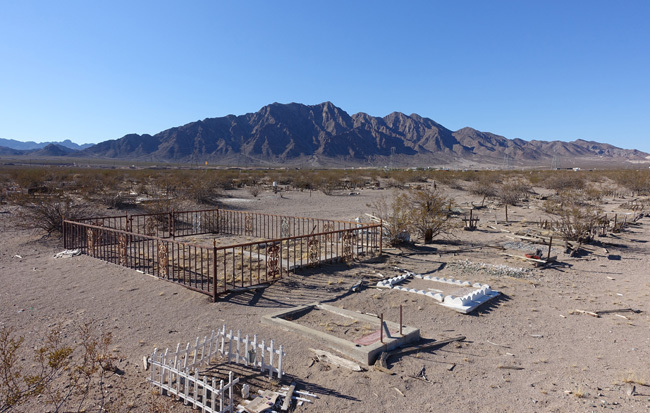 There is some speculation that the Boulder City Pet Cemetery once served as a clandestine burial ground for victims of Mafia activity in Vegas. The site is only about two dozen miles from Las Vegas, so it isn't inconceivable. 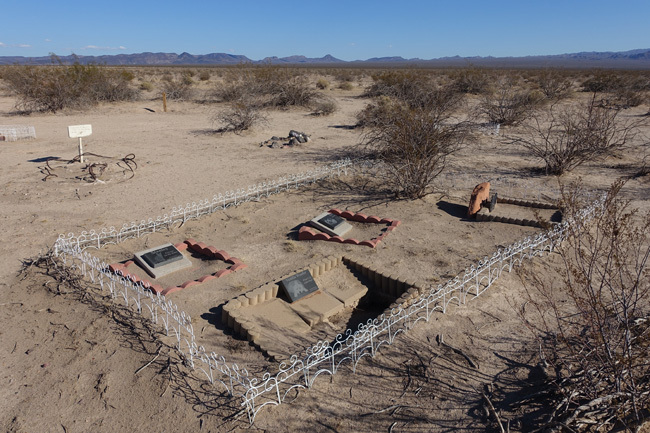 Proponents of the theory point out that it would be an ideal disposal site because no official records were kept of the cemetery's occupants, and a human grave could easily be passed off as that of a dog. It would also allow crime syndicate members to check up on the burial site without suspicion. 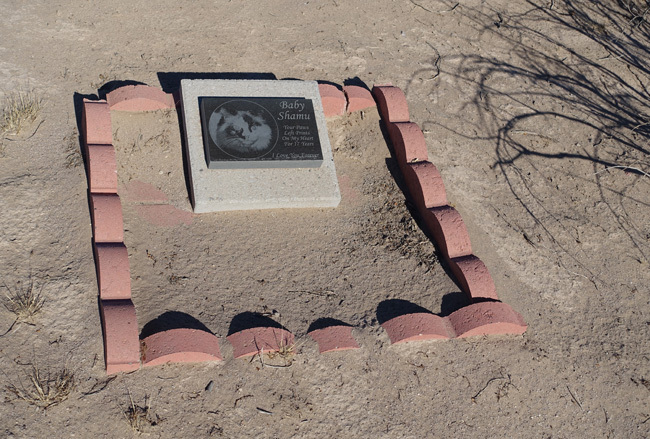 Speaking of rumors, Flash, the son of Rin Tin Tin, the famous TV canine cop, is said to be interred in Boulder City Pet Cemetery. I didn't happen upon his grave during my visit and cannot say whether or not the rumor is true. The area is actually not very suitable for a cemetery. 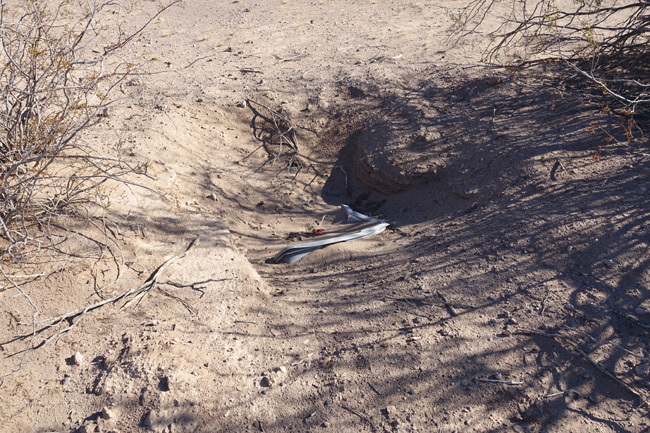 Coyotes are native to the region and have been known to dig up remains that were not buried deep enough. I saw evidence of this during my visit. Flash floods also sweep through the area, displacing the soil and occasionally carrying away grave markers. Thank you for joining me on my Epic Rust Belt Road Trip. 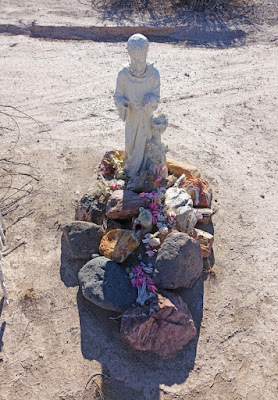 Be sure to come back next week, when I'll post pictures and stories from the ruins of the Boulder City Airport. That's creepy and sweet at the same time. Thank you. I've had a good weekend so far--spent some time with family, went to a festival and to the beach. 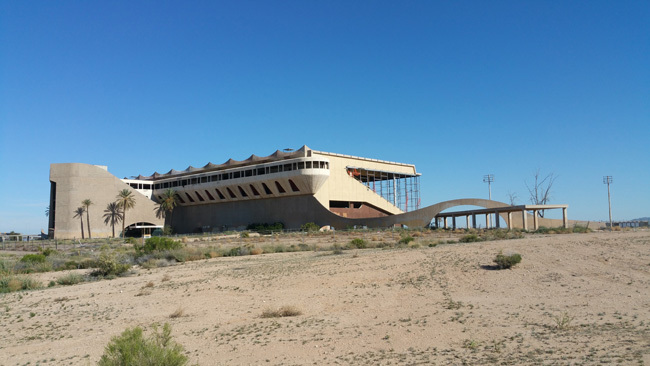 On the way home I stopped at an abandoned campground to check out an abandoned amphitheater. Sadly it was buried :/ I hope you're having a good weekend too! I agree, creepy but incredibly sweet. I was totally thinking about the fragility of the soil and then you pointed it out. Thanks for a great post! That's a shame. People who come to grieve shouldn't have to deal with graffiti and vandalism. My family were good friends with the Lockettes. 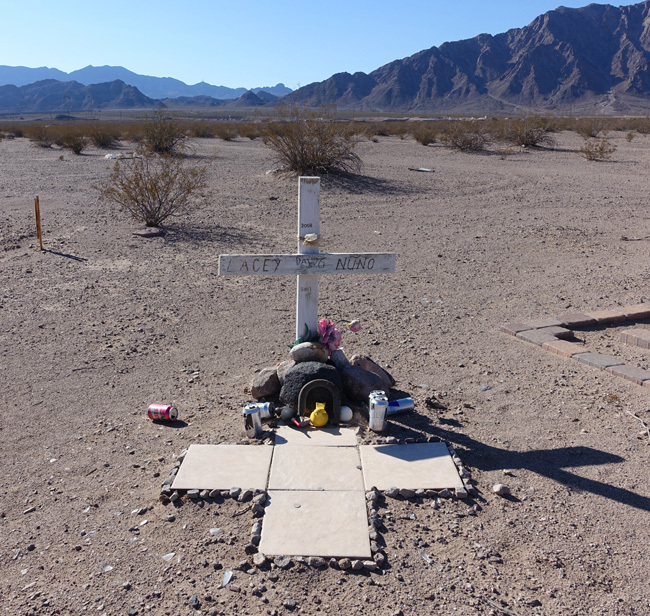 I remember my grandma saying that Emory told her that he had a pet cemetery out in the valley somewhere. I bet Emory was an interesting guy. Do you know anything more about him or why he decided to create the cemetery? I agree. They are such kind souls, and their unconditional love is amazing. I love the Fallout games! I got so immersed in Fallout 4, I played it just about every night before bed. I recently finished exploring the map and haven't played since. I'm tempted to buy the new expansion. Have you played it? I don't own Fallout 4 sadly, computer can't handle it until I upgrade it. I've heard Automatron is good though, and Wasteland Workshop just came out as well. Far Harbor also can't be that far off, and that'll have a new world to explore. Honestly, I want to get Fallout 4 to recreate obscure weapons with the crafting system. anyone have a better location ?? 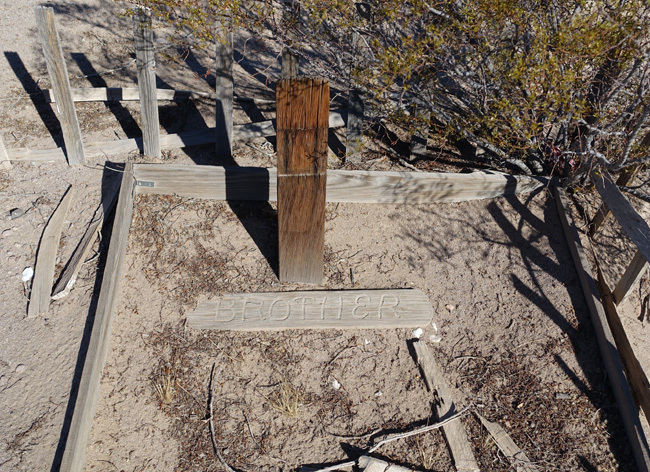 The letterbox is called Haunted Pet Cemetery (El Dorado Pet Cemetery) and my trail name is Wolf Dancer. Thanks for posting. I hadn't heard of letterboxing before. I've been geocaching a few times though. It's a lot of fun and a great excuse to explore new places. My mother-in-law had a pet cemetery in a rural area of NW IN. She had 14 acres, on which her home also stood. Your comments of caring for the deceased as if they were human reminded me of first seeing hers. It looked just like a regular cemetery, except in miniature! When she moved elsewhere and closed the business, the new owners had to agree in writing that they would allow the pet owners to come into the property to visit the deceased. I'm glad she made the new owners agree to that. Otherwise so many people would have been heartbroken if they were denied access to their pets' resting places. I lived in BC and never knew about this place. Way out of town, although it has a huge area that is not used. The grave marked as Oakley was my dog and he was the best dog a family could own. He will never be forgotten. I miss him all the time even though it's been 3 years.